So needing all of these in my life at the moment!! I have never heard of the Fresh Body Polish, but I'm going to a networking event at their offices tonight and crossing my fingers for a goodie bag!! Love these picks :) Really needing those gloves - mine are awful and don't even keep my hands warm! Love the boots too, and that body scrub looks heavenly!! I really like how those gloves are a mixture of leather and cable knit, I bet they are super warm! Fresh is one of my favorite beauty brands - the scents of each product are incredible! I'm so jealous! I cant order anything from J. Crew from Switzerland :( Everything's seems so pretty! All these products are so winter! Loving all the beauty and bath products to pamper oneself during the season! These are all so wintery and perfect! I was wondering how you make the collages? I want to make a couple for my own blog! 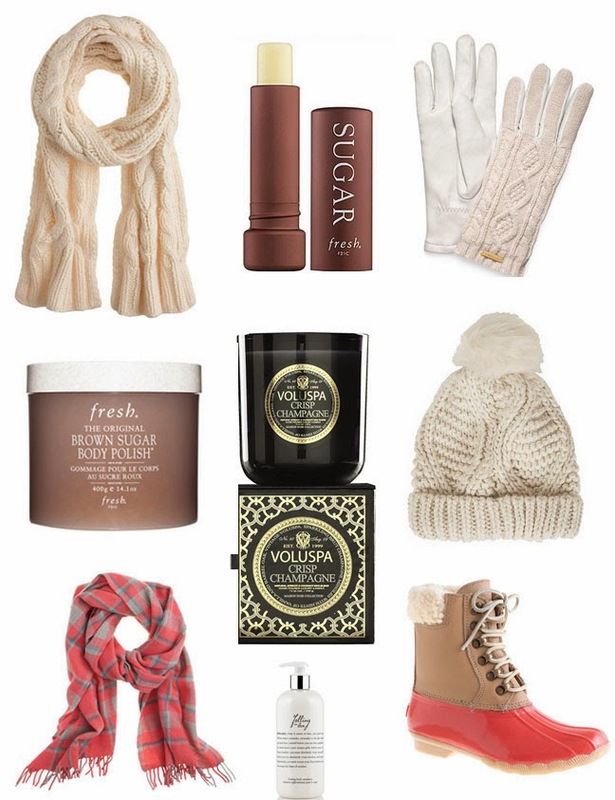 Omg volupsa candles and that sugar balm from fresh are my favorites! Great roundup! I love the Sugar lipgloss and those candles! Great post, love it all! The Sugar Lip Balm is the best. I got one as a small gif at Sephora this year and I love it. My lips get so smooth and kissable when using it. Great product. Also really like the tartan scarf. Very cute and lovely pieces, thanks for the insperation. I really love the scarf and the hand cloves and the shoes are so interesting, very special!! Those gloves also look super cozy! Great picks!!! What a fantastic selection. I love the creamy scarf and everything Brown Sugar by Fresh. Voluspa Crisp Champagne is fantastic. Voluspa Ambre Lumiere would also be a really nice addition to your collection. Thanks for sharing!